The time of the retirement of Paul, in Arabia, lasted three years (Galatians 1:11 - 12, 15 - 18). He was not destined to be the Evangelist of the East. He then travels back to Damascus from where he makes the long trip back to Jerusalem. Thus already the Apostle had experience of "perils by his own countrymen, and perils in the city." Already "in journeyings often, in weariness and painfulness" (2Corinthians 11:26 - 7) he began to learn "how great things he was to suffer" for the name of Christ (Acts 9:16). Preserved from destruction at Damascus, he turned his steps towards Jerusalem. The motive of Paul for the journey to Jerusalem, as he tells us in the Epistle to the Galatians, was a desire to become acquainted with Peter (Galatians 1:18). Not that he was ignorant of the true principles of the Gospel. He expressly tells us that he neither needed nor received any instruction in Christianity from those who were apostles before him. But Paul must have heard much from the Christians at Damascus of the Galilean fisherman. 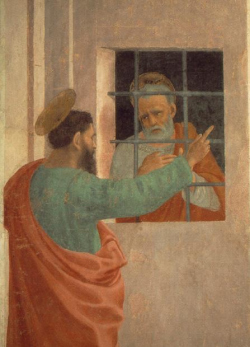 Can we wonder that Paul should desire to see Peter, one of Christ's original apostles, the brother with whom now he was consciously united in the bonds of a common apostleship? It is not a stretch to understand why the apostle to the gentiles wanted to travel to Jerusalem to meet one of the Lord's constant companions. How changed was every thing since Paul had last traveled this road between Damascus and Jerusalem! If, when the day broke, he looked back upon that city from which he had escaped under the shelter of night, as his eye ranged over the fresh gardens and the wide desert, how the remembrance of that first terrible vision would call forth a deep thanksgiving to Him, who had called him to be a "partaker of His sufferings" (1Peter 4:13). And what feelings must have attended his approach to Jerusalem! What an emotion smote Paul's heart at the first distant view of the Temple in Jerusalem, that house of sacrifice, that edifice of prophecy! Its sacrifices had been realized, the Lamb of God had been offered: its prophecies had been fulfilled, the Lord had come unto it. As he approached the gates, he might have trodden the very spot where he had so exultingly assisted in the death of Stephen, and he entered them perfectly content, were it God's will, to be dragged out through them to the same fate. When Paul entered into the city, what deep thoughts were suggested by the haunts of his youth, and by the sight of the spots where he had so eagerly sought that knowledge which he had now so eagerly abandoned! What an intolerable burden had he cast off! He felt as a glorified spirit may be supposed to feel on revisiting the scenes of its fleshly sojourn. Yet not without grief and awe could Paul look upon Jerusalem, the city of his forefathers, over which he now knew that the judgment of God was impending. And not without sad emotions could one of so tender a nature think of the alienation of those who had once been his warmest associates. The grief of Gamaliel, the indignation of the Pharisees, the fury of the Hellenistic Synagogues, all this, Paul knew, was before him. The sanguine hopes, however, springing from his own honest convictions, and his fervent zeal to communicate the truth to others, predominated in his mind. Paul thought that they would believe as he had believed upon his return. He argued thus with himself, that those in Jerusalem knew that he had imprisoned and beaten in every synagogue them that believed in Jesus Christ, and that when the blood of His martyr Stephen was shed, he also was standing by and consenting unto his death (Acts 7:58). He also knew that when they realized the change which had been produced in him, and heard the miraculous history he could tell them, they would not refuse to receive his testimony. Why does God build a New Jerusalem? What islands did Paul evangelize?